Kare-kare is a Philippine stew complemented with a thick savory peanut sauce. It is made from a variation base of stewed oxtail, pork hocks, calves feet, pig feet, beef stew meat, and occasionally offal or tripe. Kare-kare can also be made with seafood (prawns, squid, and mussels) or vegetables (sometimes exclusively vegetables, becoming Kare-kareng gulay). Vegetables, which include eggplant, Chinese cabbage, or other greens, daikon, green beans, okra, and asparagus beans are added—usually equaling or exceeding the amount of meat. The stew is flavored with ground roasted peanuts or peanut butter, onions, and garlic. It is colored with annatto and can be thickened with toasted or plain ground rice. Other flavorings may be added, but the dish is usually quite plain in tastiness, compared to other Filipino dishes. Other seasonings are added at the table. Variants may include goat meat or (rarely) chicken. 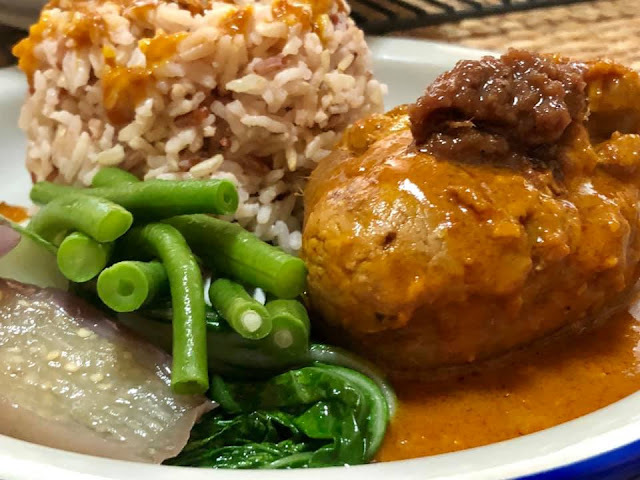 It is often eaten with bagoong (shrimp paste), sometimes spiced with chili, bagoong guisado (spiced and sautéed shrimp paste), and sprinkled with calamansi juice.Traditionally, any Filipino fiesta (particularly in Pampanga region) is not complete without kare-kare. There are several stories as to the origins of kare-kare. The first one is that it came from Pampanga. 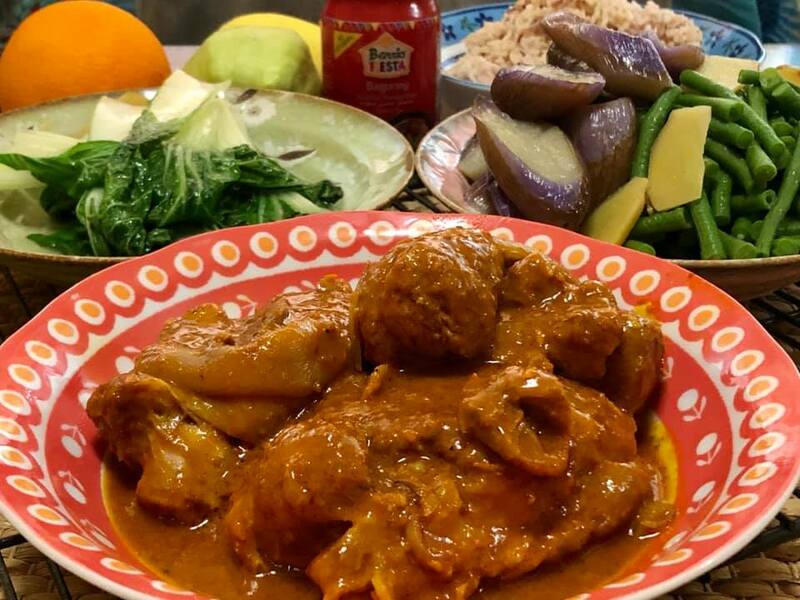 Another has it coming from the regal dishes of the Moro elite who settled in Manila before the Spanish arrival (in Sulu and Tawi-Tawi, kare-kare remains a popular dish). Another is from Sepoy conscripts from Southern India that settled in Philippines during the British occupation of Manila. Homesick, they improvised their own cuisine with available materials. They called it kari-kaari, curry, and now, kare-kare. Kare-kare is a well-known dish in Pampanga, which is often hailed as the culinary capital of the Philippines. Its name derived from the word "kari" from the word "curry". However, kare-kare is far different from Indian curry. 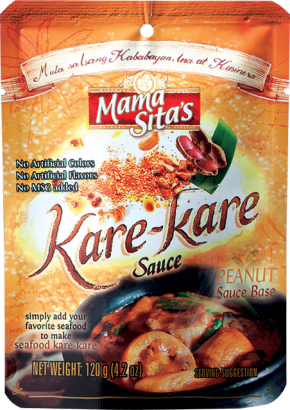 Kare-kare has a similar flavor to satay because of the peanuts in the sauce. Oxtail, with the skin on and cut into 2-inch lengths, and ox tripe are boiled until tender. Sometimes pieces of ox feet or shins are added. When the meat is tender, the soup becomes gelatinous. Ground roasted peanuts (or peanut butter), ground roasted glutinous rice is added to make the soup thicker. Annatto is added to give color. 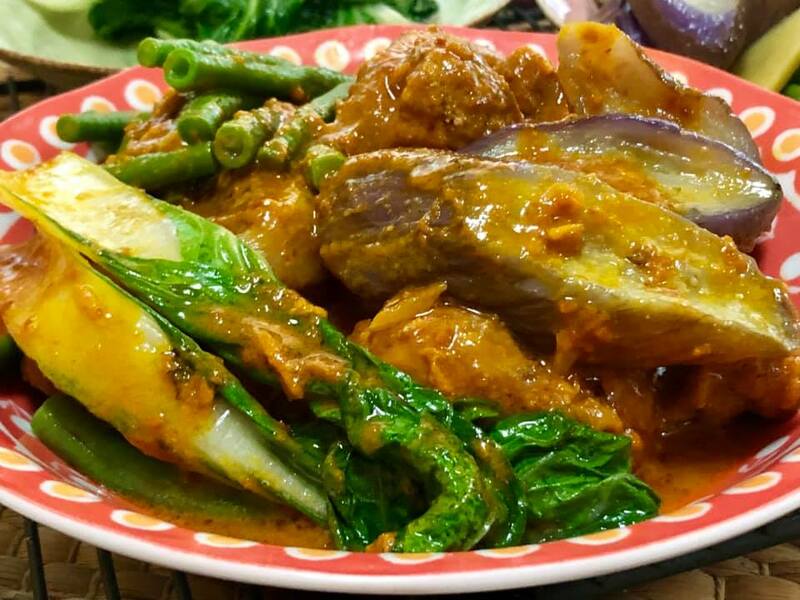 The basic vegetables for kare-kare include young banana flower bud or "heart" (puso ng saging), eggplant, string beans, and Chinese cabbage (pechay). Kare-kare is often served hot with special bagoong alamang (sauteed salted shrimp paste). Now lets go to my post I admit while reading the history, I am already contemplating how to cook the dish. First, beef and it's parts like tripe is so hard to get in Singapore. I needed to go to a market which is kinda far from our place and from what I've experienced before, communication barrier prevents me from enjoying my market experience. Oh yes, I need to learn Mandarin in simple sense. In the end, I opted to use the pig trotter and of course the ever dependable Mama Sita's Kare-Kare Mix. For migrants like us, we miss our food back home so we will find a way to simplify and adapt. Rinse well the pig trotter or pata. Pour rice wine all over it, make sure the whole part is wet with rice wine. Place in a big saucepan and cover with water. Bring to a boil and care to remove the scum as it rises.We do this in order to take out the pungent smell and taste. Next strain the broth and return it back to the saucepan, let it simmer then cooked the vegetables within two minutes interval: snake beans, eggplant, pechay. Scoop the vegetables and set aside. Set aside also the broth, you will need it later. Add the pig trotter and the kare-kare sauce in a packet. Mix them all and make sure the pig trotter is well coated with the sauce. Put the peanut butter, ground black pepper and salt. Mix well and add the salt. Pour the broth into the mixture, 2 cups first and then as it boils in simmering mode, the sauce will thicken. Just add broth according to the consistency of your preference. Cook according to the consistency of your choice. It wont take long because the meat is already cooked. How to serve: You can actually add the veggies when you are about to turn off the heat. Mix them all together and its done. In my case, I will just put the cooked meat first in serving bowl, followed by veggies and I will pour the sauce on top. This is best eaten with our local sautéed shrimp paste or you can use the bottled one. Please take note: Ours back home is authentic due to the availability of ingredients. Here in Singapore I just use the ingredients that are available for convenience and obviously to save time. I do it this way.. as you can see the sauce is just in the right consistency. 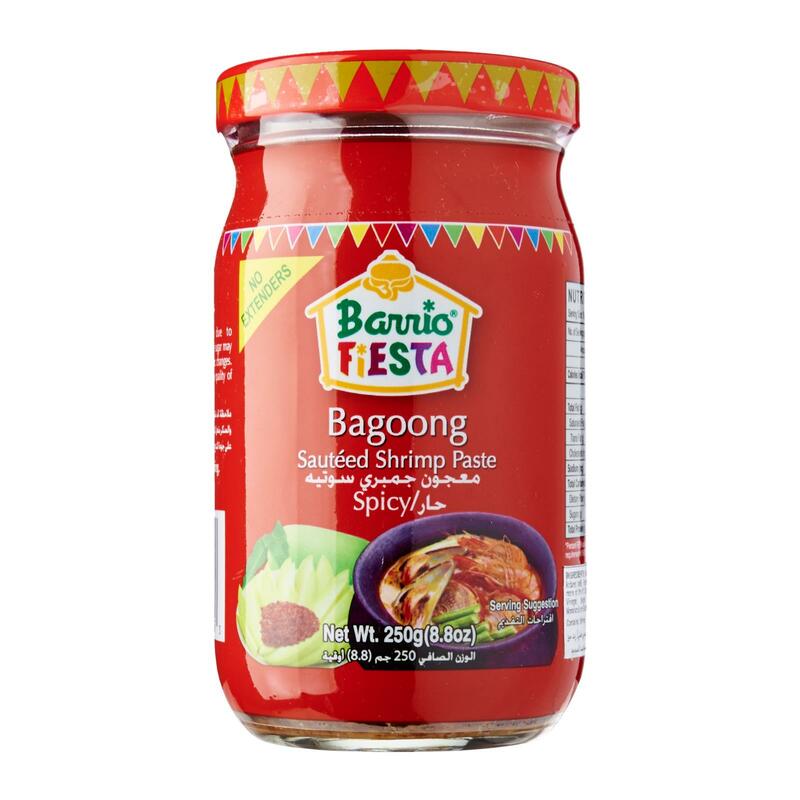 I will just add the veggies on top and at the back you can see the red bottle or small garapon as we call it in tagalog, inside this garapon is sauteed shrimp or bagoong alamang, the smallest of the shrimp and it is paste like, ready to eat. Caution: the mixture is salty. Please take note Kare-Kare is always eaten with sauteed shrimp or bagoong alamang. Why? because thats the way it should be. Lol, sorry its like this since I was born. This is how I enjoy Kare-Kare, see the sauteed shrimp on top of the meat. Lastly, above is the photo of ready to eat Sauteed shrimp. There are different varieties actually: regular, spicy, sweet etc. There are other brands but this is the only available in the shelf. This sounds and looks amazing! I actually have both goat and oxtail in the freezer waiting to be made into something tasty. Thanks! This is very interesting. The ingredients in the recipe and on your site are very different from what I find in my markets. Thanks for stopping by What'd You Do This Weekend? I always love new ideas! Ha ha ha... Linda, how I wish whats on your market is also available here. Thank you for the kind words. Have a lovely week ahead. Thank you Claire for the visit. have a lovely week ahead. This looks delicious, what great flavors! Hope you are having a great week and thanks so much for sharing your awesome recipe with us at Full Plate Thursday! Thank you so much Miz Helen for coming over. Have a great lovely weekend. I've never heard of this before. My husband (who is Vietnamese) would probably love to test out this recipe, though! Thanks so much for sharing at Sweet Inspiration! Thank you Lydia and have a lovely weekend too. Thank you Angie. I wish I could do it with oxtail but that part is so hard to find in Singapore. Have a lovely weekend.